Soybean oil, water, blue cheese (pasteurized milk, cheese cultures, salt, enzymes), distilled vinegar, sugar, salt, cellulose gel, xanthan gum, potassium chloride, enzyme modified cheeses [blue cheese (pasteurized milk, salt, culture, enzymes, calcium chloride), romano cheese (pasteurized sheeps milk, salt, rennet, culture), water, salt, disodium phosphate, enzymes, xanthan gum], lactic acid, polysorbate 60, sorbic acid and sodium benzoate and calcium disodium edta (used to protect quality), propylene glycol alginate, cellulose gum, onion powder, natural flavors, garlic powder, polysorbate 80, yeast extract, citric acid, beta carotene. 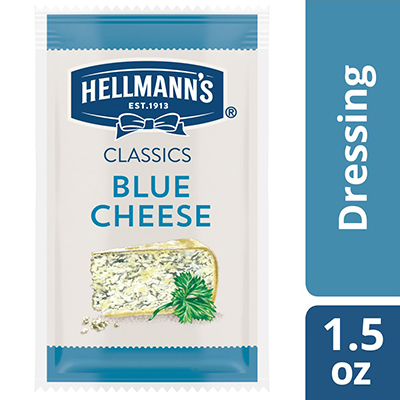 Add distinctive, authentic blue cheese flavor to your menu items with Hellmann's Classics Blue Cheese Salad Dressing. Made with real, simple ingredients that your guests can trust, this delicious salad dressing features real blue cheese chunks and contains no high fructose corn syrup or artificial flavors. It clings exceptionally well to leafy greens, helping enhance the texture and consistency of your salads. Whether paired with a house salad or served as a tasty dip for Buffalo wings, this gluten-free dressing is sure to leave your patrons with a positive impression.